Construction of additional picnic pavilions and parking facilities in the Navarre Beach Marine Park will get underway shortly after Labor Day, according to Santa Rosa County Grants and Special Programs Director Sheila Fitzgerald. The planned improvements are funded largely by a roughly $2 million Natural Resource Damage Assessment (NRDA) grant through the Florida Department of Environmental Protection (FDEP). This grant is split between two projects in the Navarre Beach Marine Park. The first and most expensive is the Navarre Beach Gulfside Walkover Complex. Under the plan, the new complex will be constructed between the two existing walkover complexes. New boardwalks that comply with the Americans with Disabilities Act (ADA) will carry beachgoers over the dunes and to the water. 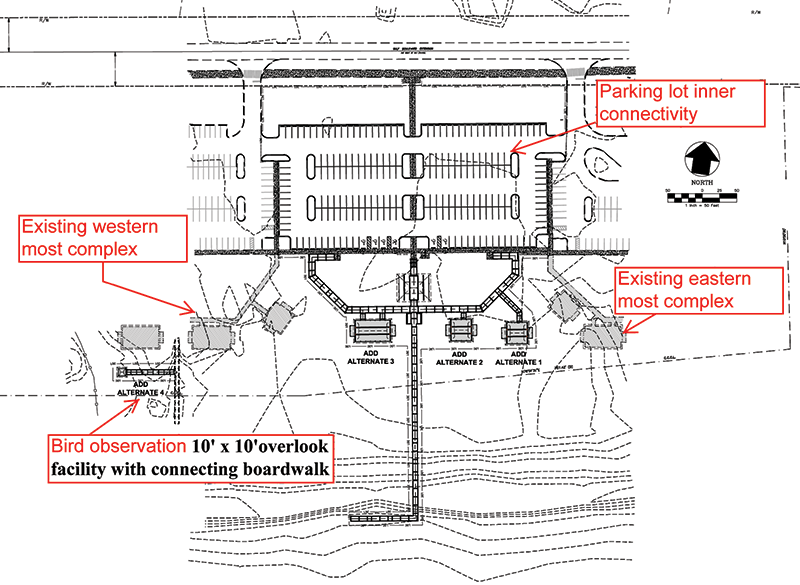 More than 100 additional parking spaces will be added with interconnection between the existing lots. At the center of the complex will be a restroom and walkways allowing access to three new reservable picnic pavilions complete with 24 new picnic tables. Capitalizing on interest in the local wildlife, the complex will also feature a 14-foot-high elevated bird-viewing area allowing visitors to get a look at nesting shorebirds, such as least terns, and their chicks. On the other side of the island, the Soundside Navarre Beach Coastal Access and Dune Restoration will include two new ADA-compliant boardwalks to the water over the dunes. 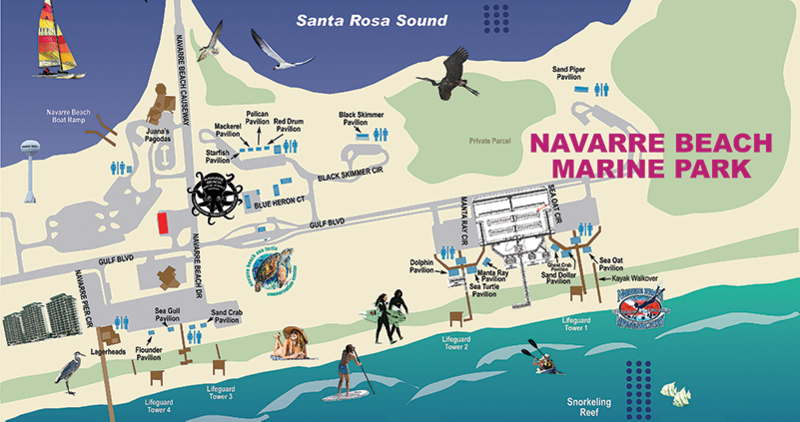 These boardwalks will connect on the east and west edges of the existing pavilions at the northwestern corner of the Navarre Beach Marine Park. A kayak launch is to be created in the center of the complex to allow easy access from the parking area to Santa Rosa Sound. Fitzgerald explained that these boardwalks help the environment by preventing visitors from walking on the dunes, which can cause harm to wildlife and to the sea oats that are crucial to the dunes. As part of the restoration, the project will also include dune vegetation planting on approximately one acre of the land. These projects have been in the works for years, but funding has been a sticking point. When the projects were initially proposed to FDEP, cost estimates came in under $2 million, meaning NRDA grants would have covered all the work. Cost estimates have increased since then, however. “The projects were initially submitted over seven years ago. The estimates were done without the benefit of engineering design…Now that it is seven years later, construction costs are higher,” Fitzgerald said. So the county was given an option: Cut the picnic pavilions from the project or pay nearly half a million dollars to get the full package. County commissioners decided to pay the difference. The Gulfside improvement project will be funded by nearly $1.47 million in NRDA funds. The Santa Rosa Board of County Commissioners opted to pitch in $493,935 for the picnic pavilions in a unanimous vote earlier this month. Those funds will come from Tourist Development Tax funds. “Once the board approved it, FDEP had the assurances they needed to award the contract to the lowest qualified bidder,” Fitzgerald said. The contract for the Gulfside improvements was awarded to RBM Contracting Services LLC of Freeport, Florida, according to FDEP records. FDEP also reported that the Soundside project has been awarded to Decks ‘N Such Marine Inc. of Fort Walton Beach as the lowest cost qualified bidder. Decks ‘N Such will complete the construction and dune restoration for $454,687 in NRDA funds. The Soundside projects are expected to be completed within five months, while the Gulfside project will likely wrap up four months after that, Fitzgerald said. She said work will be done on both projects at the same time. Navarre Beach Marine Sanctuary representative Mike Sandler said he is glad to see the improvements. “Anyone that spends a lot of time out there on a really nice day knows those parking lots are completely full. Adding another complex and additional parking, that is needed,” Sandler said. NRDA funds are also being utilized along Navarre Beach for the creation of a 2-mile-wide near-shore artificial dive reef. Located a mile from shore near the end of the Navarre Beach fishing pier, this giant artificial reef will include a variety of manmade structures designed to create new habitat and support aquatic plant growth. Sandler explained that unlike the existing snorkel reef, with its man-sized reef modules, this new reef will be composed of structures larger than an automobile and nearly 15 feet tall. They are called tetrahedrons, three-sided pyramids with hollow centers and holes on all sides. The structures allow fish to easily maneuver in and out, creating habitat. Walter Marine of Orange Beach, Alabama, will use a boat, crane and GPS tracking to place more than 500 modules in a specific pattern in 27 patches along the sea floor, according to an FDEP and Army Corp of Engineers approved layout. The reef area will include a portion in which modules will not be placed at this time. “That southern half is for future use. We don’t know what we are going to do with that yet, but additional funding may become available,” Sandler said. Laying the initial structures is being funded by $1.2 million in NRDA grant funds. An additional $210,900 in NRDA funds were spent on expanding the near-shore snorkel reef in August 2017. Once the reefs become established and plant growth spreads, the reefs could support a variety of marine life including sea turtles, sharks, octopus, a wide array of fish species, crustaceans and more. That means a higher likelihood of catching these fish along the Navarre Beach Fishing Pier located less than a mile from the northern edge of the reef structure. Sandler said the reef will also attract divers to the Navarre Beach area interested in seeing the wildlife. Placement of the reef began last week and is expected to continue through December.